Actually, though, the expression is extremely grim rather than bucolic. Plain and simple, it’s used to indicate someone is dead. For more ordinary deaths (though I’d suspect no one would consent to calling her or his death “ordinary”), this peaceful-seeming phrase is used like any other euphemism, i.e. a word or group of words, gentler on the face of it, to take the place of more blunt or disturbing language. “Yeah, good ol’ Gramps finally bit the dust. Gave up the ghost. Kicked the bucket. In other words — He. Bought. The. Farm. Back before I started this blog, I used to think my computer, teamed up with Google and the Internet, was a magical machine that would provide me with endlessly correct answers for any or all questions I posed. Show me the telephone numbers of English bookstores in Kabul! How is beef jerky manufactured? (Don’t ask.) What is the average gestation period for African elephants? But some Internet queries just don’t have satisfying answers. And that goes for the origin of the idiom buy the farm. There seems to be 3 or 4 explanations circulating on the web that concerns the meaning and origin of the idiom buy the farm, all of them synonymous with death and its finality, and all of them dubious and extremely light in terms of historical references. Close call. 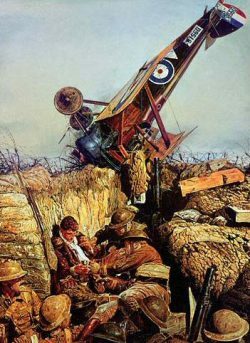 A WWI Royal Flying Corps (RFC) pilot who nearly bought it. 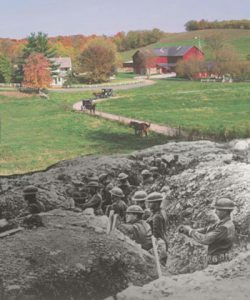 A third alternative origin history hypothesizes that to buy the farm comes from a universal wish among soldiers to leave the strife of war and retire to somewhere peaceful, a farm say. And of course death would be the ultimate retirement, a gravesite being the final piece of property where a serviceman or woman would reside. But it is the fourth backstory, though the least documented, that I believe to be a true account. Why? Because my grandfather Otto said so, when I was no older that 6 years old. 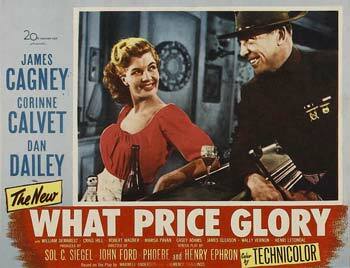 What Price Glory (1952), the first World War I movie, a romantic comedy no less, I ever saw. It was tedious and unfunny then when I was a youngster, and IMDB viewers seem to hold to that critique today. Staring James Cagney and Dan Dailey. He and I were together, watching a movie set during WWI – yes, TV used to be an intergenerational family thing back in the day – when he was the first person to talk to me about the War to End All Wars, which then had occurred less than 40 years ago. He was part of it, almost; he was drafted, but peace broke out before he was inducted. He then further explained the government gave the family of the killed soldier a death benefit of $10,000, enough, to pay off any debts on the family farm, or to buy an entirely new one. Since my allowance at the time was an impressive two shiny quarters a week, the Army remittance seemed a fortune, and adjusted for inflation, it probably was. But even as a little boy I sensed my grandfather was trying to convey that the doughboys’ deaths were something serious, big, and profound, even if I wasn’t ready to understand the whys or wherefores of the conflict. And even now, when I read headlines about issues of war and peace, that idiom to buy the farm, and my grandfather’s story behind it – sad, lonely, and eloquent – haunts me to this day as a father and a citizen. 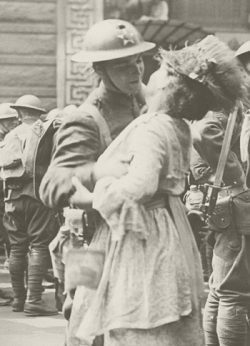 As I try mightily to end this blog on a lighter note, readers may want to listen to two songs appearing below that were extremely popular among members of the AEF (American Expeditionary Forces), during World War I and also with the civilians back home. Good Morning, Mr. Zip-Zip-Zip! 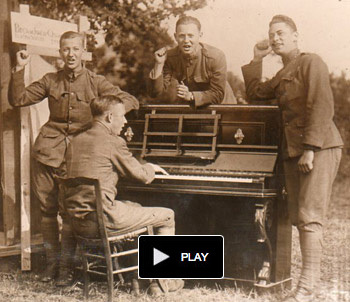 (“… with a haircut just as short as mine”) is a jaunty ragtime tune with clever lyrics that must have really resonated with our troops. Note the lyric “Ashes to ashes, and dust to dust, If the Camels don’t get you, the Fatimas must.” These lines contain the names of two brands of cigarettes, which showed an early awareness of the health hazards of smoking. Ja-Da was another hit song of 1918, written by Bob Carleton. To hear this lilting, still familiar tune, click to watch a highly listenable and truly instructive video by “Ukulele” Mike Lynch. This entry was posted on Tuesday, June 27th, 2017 at 4:01 pmand is filed under . You can follow any responses to this entry through the RSS 2.0 feed. You can leave a response, or trackback from your own site. Thanks for the post. First time I came across it was in Heinlein’s Starship Troopers, written in 1959; from what I’ve seen on the net he did Navy service in the late 20s and early 30s on board the Lexington (long out of official service, docked in my hometown as a museum piece). I imagine Heinlein must have heard it in his service days, which would have been in the post-War days; any common use in the WWI days probably informed his use.